This is our local, the Fox and Hounds. Sadly closed at present - AGAIN! It is an Enterprise Inns house but they are seeking new lessees and in a recent mail suggested to the webmaster that it would re-open fairly soon. Watch this space. 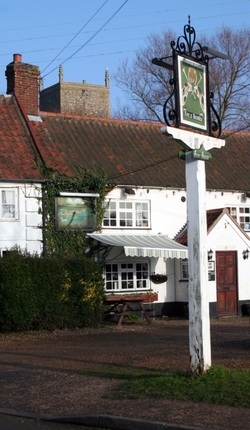 Meantime we frequent The Mermaid, an excellent little pub in the next village, Elsing. Norwich is a Fine City says the slogan - well we think its better than that. It may have been knocked about a bit by its fathers in the early 19th century, by the city fathers again during slum clearnace and by the Luftwaffe in the 40s but what remains is frankly superb. And by good planning or good fortune the biggest shoppings malls were built right in the city centre - first partly under the old livestock market by the castl;e and then on the old chocolate factory site at Westgate. Now they run shopping trips from all over the east of England and two new hotels have been built for the overnighters. But the history is terrific too - go to this site for more. I (R) first came here in about 1978 on business. There was still (too much) traffic in the city centre and even some parking on London Street. The livestock market was still thriving but on off days was a huge car park. For the next 10 years I was a regular visitor to the media outlets - it has BBC, Anglia, the biggest regional group (now Archant) and more as a result - and to our own regional HQ. I used the hotels for business events and stayed in the city many times. I loved it then. But I was away for 15 years and when I returned I feared for what I might find. In the event it was a joy of re-discovery and with more time than ever to explore. Over the following decade plus many changes have occurred but the vast majority have been for the better.